Forum on Youth Volunteerism in Nepal. 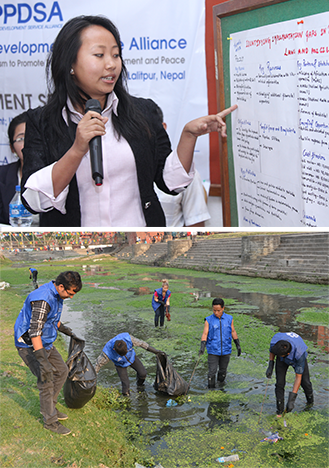 More than 260 youth, government officials, and international and domestic civil society representatives from 12 countries convened on April 23-24, 2016 in Lalitpur, an ancient city bordering Nepal’s capital of Kathmandu, to promote the role of youth and volunteerism in advancing development and peace. The two-day South Asia Sub-Regional Forum on Youth Volunteerism to Promote Participation, Development and Peace was convened on the anniversary of the crippling earthquake that struck the Himalayan nation just a year earlier. Participants observed a minute of silence in memory of those who lost their lives in the disaster. The program also recognized 12 individuals and organizations for their service in recovery efforts following the earthquake. 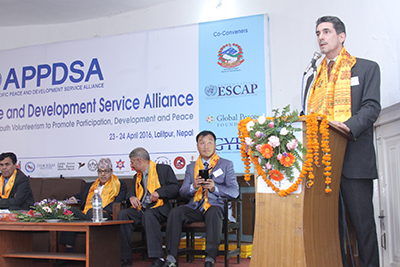 Peace and Development Service Alliance speaks at the conference. “From a year ago, the progress that we've seen, in terms of the spirit of young people and the interest in being engaged in the various areas of community service, is tremendous,” said Dr. Marco Roncarati, Social Affairs Officer of the United Nations Economic and Social Commission for Asia and the Pacific (UNESCAP) and Co-Chair of the Asia-Pacific Peace and Development Service Alliance. The Sub-Regional Forum advanced youth engagement in environmental service, peacebuilding and enhanced disaster risk assessment and response. It also provided a platform for youths to share knowledge and best practices, enhance collaboration among various stakeholders, and identify model projects and follow-up implementation strategies for youth engagement furthering the 2030 Agenda for Sustainable Development. The forum was inaugurated by Er. Ganesh Shah, Nepal’s former Minster of Environment, Science and Technology. Dr. Madhabi Bhatta, Commissioner of Truth and Reconciliation Commission and Mr. Madhav Dhungel, Vice-Chairman of the National Youth Council, Ministry of Youth and Sports, were special guests of the inaugural session. The forum also recognized three journalists for outstanding news coverage in their respective areas. Mr. Durga Dulal of Nagarik News was awarded in the area of Peace and Harmony; Mr. Sabin Sharma of Rajdhani News in the area of Environment Service; and Mr. Rohit Bhandari of Sagarmatha Television in the area of Disaster Management. The youths also participated in panel discussions with experts addressing areas of Policy, Youth Engagement, Social Entrepreneurship, Media and Awareness, and Partnership and Collaboration. From these sessions, 15 innovative, action-oriented project models (5 under each cluster) were presented by youth participants, with the best three models recognized during the closing ceremony on April 24.
during the environmental protection session. 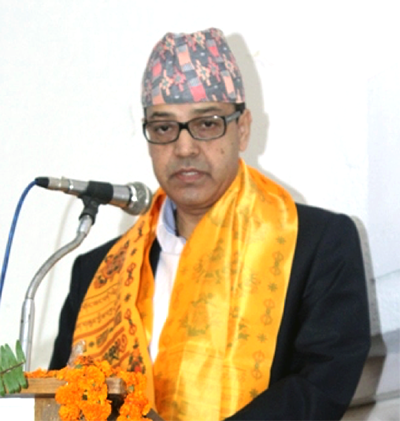 during the 2016 APPDSA convening in Kathmandu. At the closing session, officials representing the Ministry of Youth and Sports, UNESCAP, Nepal’s Academy of Science and Technology, Tribuvan University, and Global Peace Foundation further highlighted the role of youth volunteerism to promote development and peace, while emphasizing the way forward for ideas and models discussed and developed at the Forum to be implemented on the ground. 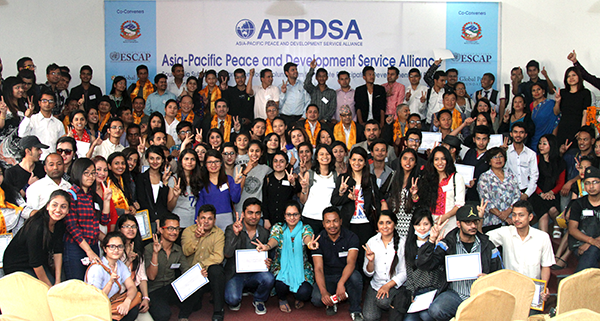 The Asia-Pacific Peace and Development Service Alliance (APPDSA), a youth and multilateral stakeholder consortium committed to further empowering youth and communities through volunteerism, was launched at the United Nations Conference Center in Bangkok in October 2014. 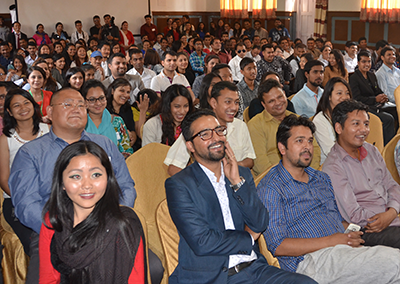 A follow-up youth assembly in Kathmandu, Nepal was convened in March 2015, just weeks before the 7.8 magnitude earthquake that struck the country. Following the quake, volunteers from the Global Peace Foundation and APPDSA organized the campaign Rise Nepal, engaging 2,000 Nepali youth volunteers in relief efforts throughout the affected region serving nearly 3,000 impacted families with transitional housing, food and medical care. Youth participants at the closing of the conference. The South Asia Regional Forum was jointly organized by the Ministry of Youth and Sports, Global Peace Foundation, UNESCAP, and Global Young Leaders Academy. Other supporting partners included UN Habitat and UN Volunteers, the Center for Social Change; Digo Bikas Institute, Jagriti Child and Youth Concern Nepal, Tribuvan University's Central Department of Environment Science and Department of Peace, Conflict and Development Studies, Youth Thinkers Society, Youth Advocacy Nepal, Resources Himalaya Foundation, Swoyambu Community Learning Centre, Lumbini World Peace Forum and Golden Gate International College.